This technology uses high-intensity light in fiber optic cable to transfer up to kilowatts of power. 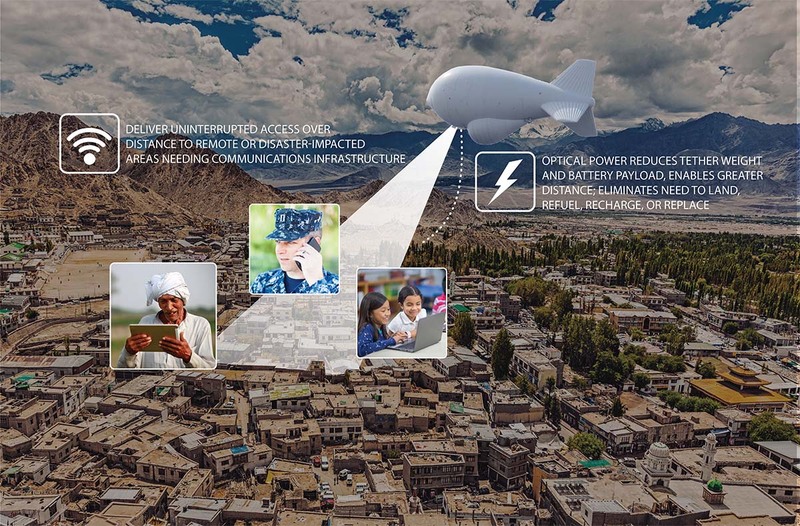 PowerLight Power Over Fiber technology supports tethered unmanned aerial vehicles (UAVs). The technology continuously powers tethered UAVs with less weight, through more distance than copper power lines. For example, at 500 watts and 300 meters, fiber optic cable is eight-times lighter than copper wire. Compared to platforms using copper wire, which must push large amounts of power up the cable to allow for electrical losses in the wire, Power Over Fiber technology increases feasibility at altitudes of more than 150 meters. Unlike battery-only designs, the technology recharges the tethered UAV while it is airborne, reducing takeoffs and landings, which are the highest-risk situations of UAV operation. The non-copper tether eliminates a detectable electrical signature, which is important for certain stealthy applications. Power Over Fiber technology is here today, and it is safe. It powers the tethered UAV while it is in motion and at altitude. Also, its lighter weight compared to batteries allows more value-adding payload through equipment such as cameras and communications gear. Industries that can greatly benefit from Power Over Fiber technology with tethered UAVs include telecommunications, disaster response, defense, law enforcement, border enforcement and entertainment events.